Viewing topic "Mutec Flash 2GB…?!?!!?!?" It’s only useful if the processor’s address space can take advantage of it. Let’s say you fill one slot with a 2 GB module. Will a module installed in the remaining slot be seen? If so, what capacity could be used? failure, noise, etc. And Mutec doesn’t “service” them because they’re in Europe. You buy, you break - too bad. The maximum Flash RAM that the Motif XF can address is 2GB, spread across two slots - 1 GB in each slot. You can go ahead and purchase the 2GB Mutec flashboard, install it, see what happens. But don’t be surprised or angry if it doesn’t work. would the use of a non-proprietary module like these invalidate a motif warranty if some damage occurred? I’m not a technician and perhaps there is no risk to the Motif....just curious? Yes, that would invalidate the warranty if it somehow broke something internally in the Motif XF. The new FlashRAM expansion will surely be compatible with the MotifXF, if Mutec states it. The user Musiker Lanze wrote a review about the new 2GB Mutec flash boards in the German Musiker-Board. The Test can be found here. So .. here are the results of my test of the new and upcoming 2 GB Flash Module MUTEC FMC-07. [...]Mutec had asked me if I was willing to test the 2GB flash on my Motif XF. Why, yes! Yesterday two of the new flash modules arrived and off we went. I installed both flash boards, and after rebooting the Motif they were recognized immediately with their full capacity. I loaded two sound sets into the flash that have been programmed with many single samples ("Inspiration in a Flash” by Yamaha and “Super Session” by Easy Sounds). That took about one half of one flash boards capacity (just under 1 GB), and when I wanted to load another set, as I had guessed, the error message “Sample Memory Full” appeared. Meaning , and that was actually presumed in advance that the maximum number of 2048 Waveforms and 8192 samples persists. But this is indeed a matter of the Motifs OS and not dependent on the flash board. Then I tested if different flash boards are running together, e.g. slot 1 with the 2GB Mutec Flash and slot 2 with 1GB of Yamaha and vice versa [...] These two different combinations work. One can then safely assume that the 2 GB modules will also work togehther with a 512 MB board. And of course the board also works as a single board. Then I reloaded my own backup backup in the Motif with the 2GB modules installed. I tested if everything works fine...I couldn’t find any problems...works. 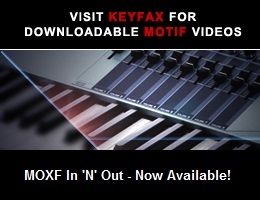 The Motif community should be sure delighted that you can now have up to 4 GB of flash on the Motif XF. Yamaha should change the Motif OS and remove the limit in terms of samples / waveforms for the flash boards [...] It makes a big difference if you have 2 GB or 4 GB flash in Motif. Many of the musicians on the stage work indeed partially with audio tracks, and with 4 GB available you also gain space for more complex samples. On the Tyros 5 they also remved this limitation of 9999 samples, and I hope that Yamaha can manage this with an update, provided that this is feasible for the Motif. Thanks for posting that. I still have a concern about usage of the full 2 GB per module, and I see that you raised the same issue with Musiker Lanze on the German board. I had previously emailed MUTEC about this, and this morning they replied. I was told that “Yes, the FMC-07 works in the MOTIF XF, you can use up to 4GB of FlashROM now. But please note, that the number of useable samples/waveforms will be not increased”. I’ll wait for further confirmation (from Musiker Lanze and/or others) before being fully convinced. is worthless. Yes, the Mutec board obviously works. No, it doesn’t allow you to store “more” waveforms than what the XF operating system can address. libraries on mirror sites so everyone can have “the sounds they deserve”. to give you any advantage. Case closed. 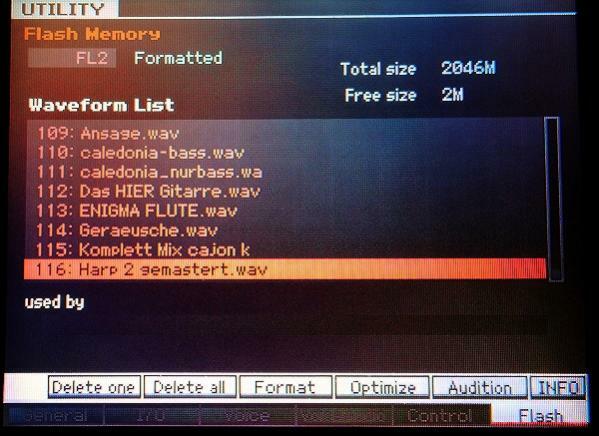 Additional info from the German Musiker-Board: The Flash-Board indeed CAN be filled up with 2GB of samples/waveforms for a total of 4GB in the Motif XF and 2GB in the MOXF!!! 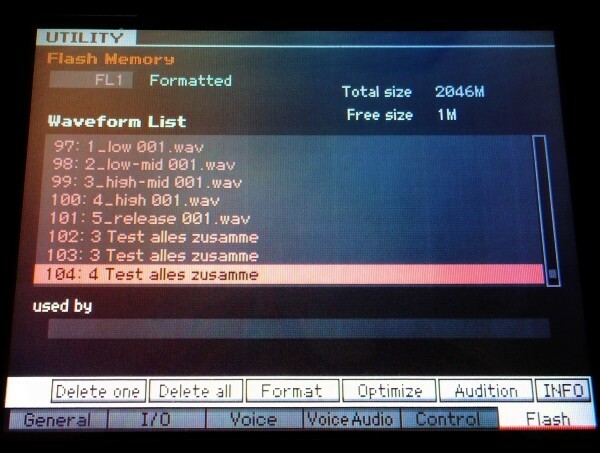 According to “Musiker Lanze’s” and “hape13’s” (hape tested two different boards on his MOXF) tests, loaded voices are working as normal, and long .wav-files can be played from the sequencer without noise/latency/crashes...with Flash-Boards totally filled up; the latter one could be relevant when one wants to play long Backing Tracks from the sequencer, for example. Dave, you’re neglecting the situations where there are very few samples, but they’re large. One case in point, Chick’s Mark V.
DschoKeys, I absolutely agree...the ability to utilize longer/larger .WAV files from Flash is huge...even without the ability to STORE any additional WAVEFORMS or Samples (by count) than allowed by the OS. Vielen Dank, Jo. The tests by hape13 (Hans-Peter Henkel) and Musiker Lanze are quite compelling. DschoKeys, I absolutely agree...the ability to utilize long/large .WAV files from Flash is huge...even without the ability to STORE any additional WAVEFORMS or Samples (by count) than allowed by the OS. as it does loading it to a 1GB board. the limit on your Mutec board. Musiker Lanze installed two Flash Boards at the same time and filled them both up with two GB of samples/waveforms EACH! Everything worked as expected. Nobody besides yourself brought up the issue of loading time. The point that I made was that Chick’s Mark V is huge (400MB), but has few (five) WAVs. I had considered Chick’s Mark V not worth keeping installed because it hogged so much valuable space, but if larger flash memory is available then it’s less of a problem. I respectfully suggest that you look at the evidence presented on the German site. Google Translate isn’t perfect, but it’s adequate. If nothing else, please look at the pictures that DschoKeys linked to.